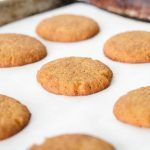 Delicious, nut-free Keto Pumpkin Snickerdoodle cookies made with coconut flour. These super easy, low carb cookies are the best sugar-free cookie for the fall and winter holidays! I was cruising around Pinterest and a photo of pumpkin snickerdoodles from Jacklyn at Cooking Classy stopped me in my tracks. Oh my word, they looked delicious! Predictably, the recipe was full of sugar and gluten, which both make my body feel terrible. Darn it! But I’m nothing if not basic, and I love a good pumpkin cookie. So I had to get to work on a keto-fied pumpkin snickerdoodle cookie recipe. Swerve’s new brown sugar substitute is making another appearance in this recipe because I just love it! It tastes and behaves so much like brown sugar. I’m also using Vital Proteins’ Collagen Peptides. The collagen adds chewiness to the texture, and while collagen isn’t a complete protein, it has loads of other benefits. 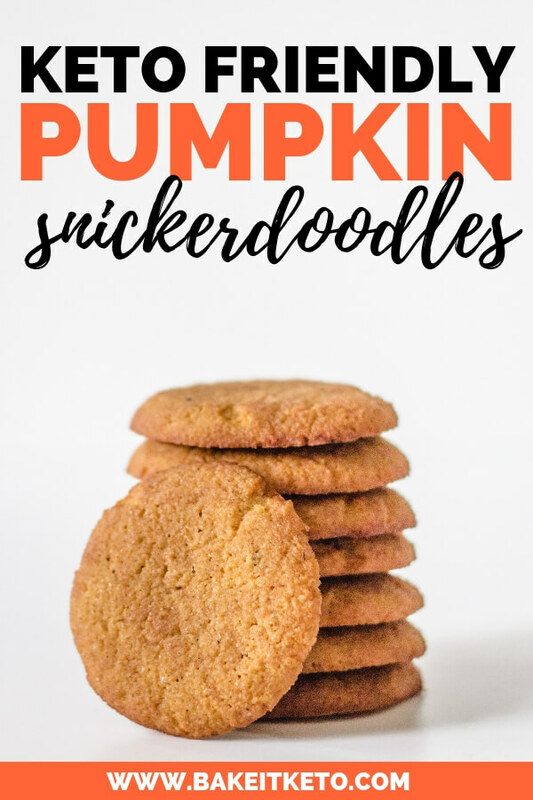 These snickerdoodles fulfill all of my keto pumpkin cookie dreams and I hope you enjoy them too! They would be perfect to bring to a Thanksgiving dinner and they store well in an airtight container (although they’re too delicious to last very long in my house!). In the bowl of a stand mixer, cream together the butter, granulated swerve, and brown swerve until light and fluffy. One at a time, beat in the vanilla, egg, and pumpkin puree, mixing until thoroughly combined and scraping down the sides of the bowl after each addition. In a separate bowl, combine the coconut flour, collagen peptides, baking powder, salt, and pumpkin spice. Slowly mix the dry ingredients into the wet, stopping to scrape down the sides of the bowl as needed. Scrape the dough out onto a sheet of plastic wrap, form it roughly into a disc, and wrap the dough up in the plastic wrap. Chill the cookie dough for 30 minutes. While the dough is chilling, mix together the swerve and cinnamon to create the cinnamon "sugar" snickerdoodle coating. Scoop the dough into heaping tablespoon sized balls, and roll the dough balls in the cinnamon "sugar" to coat them. Evenly place the cookies on parchment lined cookie sheets, and gently flatten them slightly with the heel of your palm or the bottom of a clean glass. Bake at 325 degrees F for 10-15 minutes, turning and rotating the cookie sheets halfway through the baking time, and being careful not to let the edges brown too much. 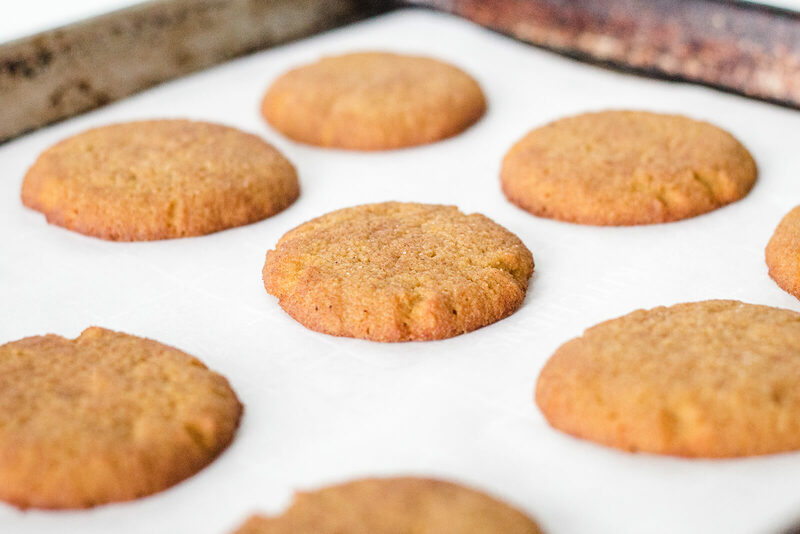 WANT TO SAVE THESE KETO PUMPKIN SNICKERDOODLES FOR LATER? CLICK HERE TO PIN THIS RECIPE TO YOUR FAVORITE KETO PINTEREST BOARD!